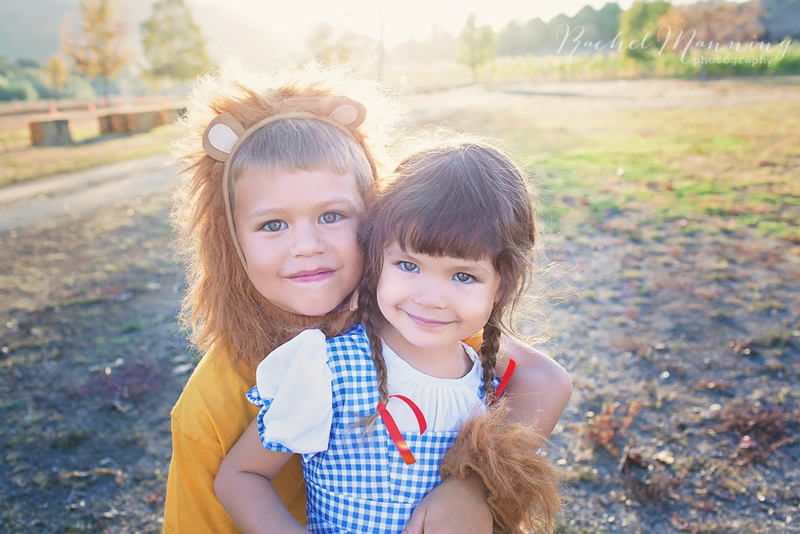 Presenting my Littles as Dorothy and the Cowardly Lion. This was earlier this month when I decided on a whim to photograph them while visiting the pumpkin patch. I had picked up Eva’s costume on clearance last year and I found Asher’s lion costume at Target. It’s actually a dog costume (only $6.99) so the bonus is our dog can wear it too. Asher is now 7 years old and he was very aware of the fact that the lion costume was “babyish”. Luckily, I was able to bribe him with a new Lego set. Yes, I had to break out the big guns for this. Next year I’m sure I’ll be out of luck. No more cute costumes for him. There are no pumpkins in these photos because they switch the area where they grow their pumpkins every other year to keep the soil healthy. Unfortunately, that meant that the pumpkin field was not located where I could get that pretty back-lighting I love. I decided to do the session in the straw maze and the corn field instead. It just so happens this month’s Project Ten theme (which I haven’t had the time to participate in for several months) is lines. I confess I didn’t plan this session around that theme, but it happens to fit it well with the lines of the hay, corn stalks, and on Eva’s gingham Dorothy dress. I’ll take it! 😉 Also, I tried to capture some rainbow sun flare since rainbows are very appropriate for this session. It was such a fun session for me to capture!